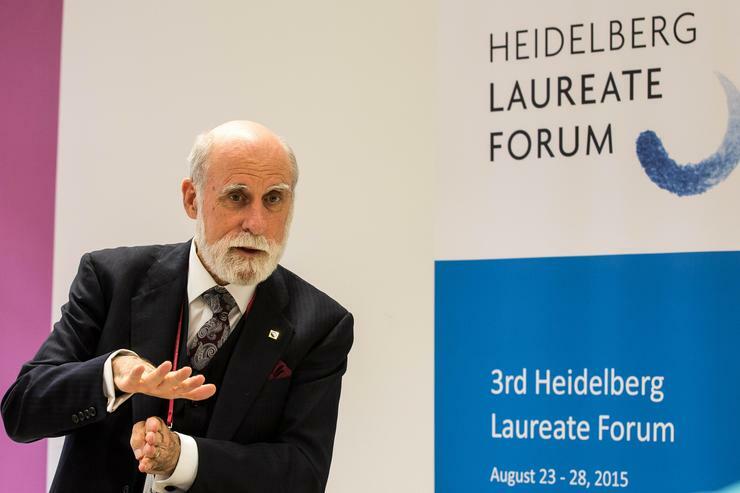 Vint Cerf is considered a father of the internet, but that doesn't mean there aren't things he would do differently if given a fresh chance to create it all over again. "If I could have justified it, putting in a 128-bit address space would have been nice so we wouldn't have to go through this painful, 20-year process of going from IPv4 to IPv6," Cerf told an audience of journalists Thursday during a press conference at the Heidelberg Laureate Forum in Germany. IPv4, the first publicly used version of the Internet Protocol, included an addressing system that used 32-bit numerical identifiers. It soon became apparent that it would lead to an exhaustion of addresses, however, spurring the creation of IPv6 as a replacement. Roughly a year ago, North America officially ran out of new addresses based on IPv4. For security, public key cryptography is another thing Cerf would like to have added, had it been feasible. Trouble is, neither idea is likely to have made it into the final result at the time. "I doubt I could have gotten away with either one," said Cerf, who won a Turing Award in 2004 and is now vice president and chief internet evangelist at Google. "So today we have to retrofit." The 128-bit address space, for instance, "wouldn't have seemed realistic back then," he said. Particularly given the effort's experimental mind-set at the time, "I don't think we could have forced that." There actually was debate about the possibility of variable-length addresses, but proponents of the idea were ultimately defeated because of the extra processing power associated with them, he explained. "Because computers were so expensive back then, we rejected the idea." As for public key cryptography, the notion had only recently emerged around the time the internet protocols were being standardized back in 1978. "I didn't want to go back and retrofit everything, so we didn't include it," Cerf said. "If I could go back and put in public key crypto, I probably would try."